Life in the sea supports many industry sectors and is enjoyed by large numbers of people living in coastal and in inland areas. The Marine Biodiversity Observation Network (MBON) links groups engaged in ocean observation to track changes in the diversity and abundance of life in the sea. Please take your lunch break with SECOORA and join in on the dialogue with stakeholders and MBON to refine these ideas and advance an integrated system to observe life in the sea. Life in the sea supports many industry sectors and is enjoyed by large numbers of people living in coastal and in inland areas. The Marine Biodiversity Observation Network (MBON) links groups engaged in ocean observation to track changes in the diversity and abundance of life in the sea. This information is needed to measure whether the benefits that people derive from different marine organisms are affected or not as we find ways to sustain their uses while the ocean is changing. In the region covered by the Southeast Coastal Ocean Observing Regional Association (SECOORA), MBON works in partnership with the Florida Keys National Marine Sanctuary and the Integrated Ocean Observing System to integrate traditional and new means of tracing changes in marine biodiversity. We developed novel environmental DNA methods and are developing indicators to evaluate changes in living communities. Dynamic ‘seascapes’ based on remote sensing extend the spatial footprint of in situ data to track dynamic biogeographic regions. We promote adoption of the Darwin Core data schema as a way to standardize archiving and distribution of marine biology data. This is essential if we want to understand patterns of change in marine life in any locality in the context of changes happening over large areas, and broadly share applications to do so. 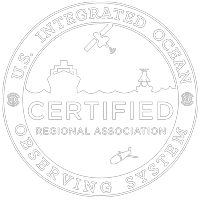 Internationally, MBON works with the Global Ocean Observing System (GOOS), the Ocean Biogeographic Information System (OBIS), the IOC Ocean Best Practices Group, and others to promote documentation of marine biodiversity for the benefit of society. The goal is to integrate marine biological Essential Biodiversity Variables (EBVs) and Essential Ocean Variables (EOVs) into the existing and planned national and international ocean observing systems. We invite the IOOS community to join in the dialogue with stakeholders and MBON to refine these ideas and advance an integrated system to observe life in the sea. Frank E. Muller-Karger is a biological oceanographer who conducts research on marine primary production and the diversity of life in the sea. He combines traditional oceanographic methods and satellite remote sensing to study patterns of phytoplankton distribution and how these patterns change over time. Muller-Karger studies the oceanography of the Gulf of Mexico, the Caribbean Sea, the Atlantic Ocean, and also has some work of global scope. He is engaged in outreach efforts to promote STEM education of the public and recruitment of under-represented groups into marine science. Muller-Karger has received several honors, including the Gulf Guardian Award from the EPA, the NASA Jet Propulsion Laboratory Award for Outstanding Contributions, the NASA Administrator Award for Exceptional Contribution and Service, the Julius A. Stratton Award for Leadership, and served on the U.S. Commission on Ocean Policy and on the Ocean Studies Board. He is involved in a number of international working groups including the Marine Biodiversity Observation Network (MBON) of GEO BON and the Global Ocean Observing System (GOOS) Bio-Eco panel. He holds B.S., M.S. and Ph.D. degrees in marine science and a Masters degree in management. He has authored or co-authored over 160 scientific publications. Enrique Montes is a Research Associate in biological oceanography at the College of Marine Science, University of South Florida. While he was born in the U.K. he grew up in Venezuela. Montes came to the U.S.A with a Fulbright fellowship in 2006 for his Ph.D. at the University of South Florida and the University of Massachusetts Dartmouth, and completed his degree in 2011. Montes studies physical and biological drivers of carbon, nitrogen and oxygen cycling in the ocean, and how these cycles affect marine ecosystems across time and space scales. Montes studies these processes using measurements of sinking particulate matter with moored and free-drifting sediment traps, dissolved nutrients and gases, and composition and abundance of phytoplankton, and relies on satellite observations to scale in situ observations to broader domains. Montes is involved in the development of a pilot Marine Biodiversity Observation Network (MBON) co-sponsored by NASA and NOAA-IOOS. His current research seeks to understand how natural and human-induced processes drive changes in biodiversity of coastal and open ocean habitats using seascape ecology derived from satellite data, and genomics. Montes is leading the development of the Pole-to-Pole MBON of the Americas, a collaborative regional effort aimed at detecting and understanding biodiversity change in marine ecosystem of the Americas, from the Arctic to Antarctica.